Serendipity. We were passing through Kanab on our way... somewhere else... but we had some history and old friends in southern Utah, so we paused to visit. We never left. Everything just sort of came together around us, and here we are. From the moment the doors opened in1994, The Willow has had a life of its own. We had the vision to establish The Willow, and we poured our selves and our resources into that vast dream—but it has never been ours alone. The staff that nurtured the business in its formative years, like Kriston, Estelle, Todd, and Amanda, imparted their own influence and fostered a culture of team play that continues today. The Willow has become part of the Kanab community, part of the high desert landscape. It reflects the desires and the imaginations of those who have shopped here over two decades—some from around the corner, others from around the world. It is an oasis, a gathering place, a sanctuary. And it is a place that inspires adventure. 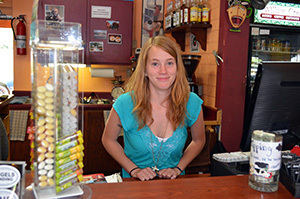 We fit a lot into the 1,300 square feet under The Willow, but we focus on our Colorado Plateau location and what it calls for. We insist on quality goods at a fair price. And we stand behind it all. We love to swap stories. We feel blessed to be in a business that allows us to connect with people—from all walks of life and from all over the world—who share our passions. I grew up surfing and sailing in San Diego, California. I hiked and backpacked the mountains and deserts of southern California in the early seventies. About that time, I came to Kanab to work on a steel power line. On my days off, I explored the area’s beautiful national parks. My experience on the Colorado Plateau made geology an easy choice for a major when I applied my G.I. Bill at San Diego State University. In 1988 White Water River Expeditions invited me to join a Grand Canyon river trip as geologic expert. The pay was $20 a day with $18 taken out for meals; I still have the check for $16. But ever since, I’ve badgered boatmen from Grand Canyon Expeditions and Colorado River and Trail Expeditions to let me swamp trips. Back in California, I gave up the oil fields and the geotechnical trade. I left Carlsbad in 1994 with Susan and our kids, Jake and Leah, to live in beautiful Kanab and start The Willow. We found our niche. In addition to overseeing the day-to-day operations of the shop, Charlie manages the espresso bar and is the book buyer. Charlie lives in his Royal Robbins® long sleeve Expedition Shirt and his Outdoor Research® Ferrosi Shorts all summer long. In winter he layers up in Patagonia® Capilene and R1, and in Ibex® merino wool. He has long been accused of being the "Imelda Marcos" of outdoor shoes. His collection of Chaco® sandals is out of control. My father was a soldier who settled our family in Colorado when I was six. He introduced me to some of my early outdoor adventures. But my mother had a more subtle influence: When my three older sisters and I got rowdy or expressed boredom, she would respond: “Go outside and play.” I did as she suggested, and I’ve been richly rewarded. I studied animal behavior at Fort Lewis College in Durango, spending my summers as a ranger in Mesa Verde and Glacier National Parks. When I graduated, I worked with the education department of the San Diego Zoo and Wild Animal Park until 1994. Then I somehow gave up the ocean and the surf and my career, left our friends and our home at the beach, and woke up in red rocks. With much support and kibitzing from staff and passersby, Susan chooses the gear, apparel, and footwear for The Willow. These days, she carries an Osprey® Sirrus 24 for long day hikes, or her Camelbak® torso pack for shorter outings and horseback rides with her Arabian, Shamal. 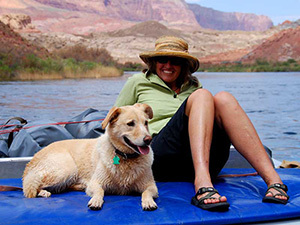 She takes at least three sarongs on every Grand Canyon dory trip, and uses them all. Eagle Creek® makes her favorite travel towel. She swears by Sierra Madre SPF 30 sunscreen, made by Super Salve®, but prefers Joshua Tree’s® stick sunscreen for her face and hands-free application. She rock-hops in Chaco® Z-1’s or Vibram® Spyridons (which she says are awesome for slacklining). She’s partial to the Princeten Tec® ReMix headlamp with the bright red LED. Her favorite adventure stories include South by Sir Earnest Shackleton and River of Doubt by Candace Millard. Her favorite quote comes from Everett Reuss. She drinks a cappuccino to warm up and an iced latte with four drops of Monin’s® Mandarin Orange in the summer heat. I was born and raised in Utah County. I’ve traveled some, but I can't seem to leave this beautiful place behind. I fell in love with wilderness at a young age. My first job was at an outdoor education camp with my Dad and older sister. I built a strong connection to and appreciation for anything outdoors. My Dad took me rock climbing and river rafting. As a family we all went camping whenever we could. I love living in Kanab because I’m close to places where I can do all of those things. 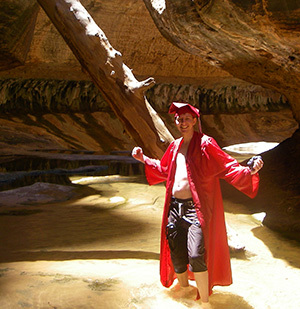 I especially love to crack climb in Zion, hike with our dogs, and swim in the rare water holes and rivers of the high desert. My favorite outdoor activity involves water near good desert plants and sand. My time at the Willow has taught me so much about the amazing area I live in. I can't wait to have more adventures! Alex’s brother, Will, suggested she read Ed Abbey's The Fool's Progress. It quickly became her favorite book. Born To Run by Christopher Mcdougall helped her get involved in trail running and introduced her to Vibram FiveFingers®. running shoes. At the time my parents settled in Kanab, I was only a few months old, and barely a year old when they opened The Willow. I grew up around the regular customers who would hang out behind the shop. I often walked directly to The Willow from school. I started officially working for my parents at 14, a freshman in high school. Since then I’ve graduated, and recently indulged in traveling in Europe, but I still come back to family—both literally and figuratively—at The Willow. I plan to attend University of Utah in Salt Lake City where I’ll study Computer Science. Jake likes to use his tough Imlay® pack for canyoneering, with his Black Diamond® harness and ATC devices for safety. He enjoys historical non-fiction as well as epics, such as Robert Jordan’s Wheel of Time series. 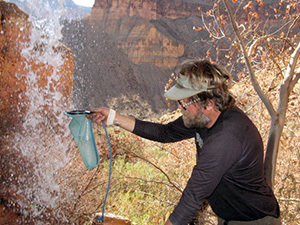 Although not an official member of our staff, Allen Gilberg makes many contributions to Willow Canyon Outdoor. He is our marketing wizard and sign maker. He also makes some of the most popular products in our shop: His stickers have made their way around the world by now, and his photography adorns some of our best-loved notecards.. 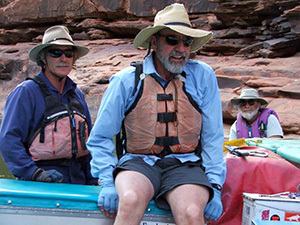 He spends much of his time as a boatman in the Grand Canyon, rowing or running support for the Grand Canyon Expeditions dory program, GCEx.com. His own business, Gilberg Design®, is basedin Kanab: http://www.gilbergdesign.com/.